At the beginning of 2015, Arizona Tile blogged about four strong kitchen design trends that we at Dorado Soapstone couldn’t be happier about. Here they are. 1. 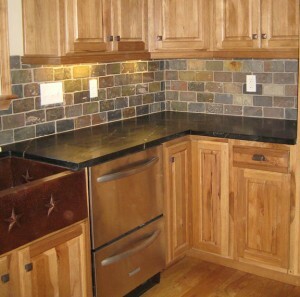 Stone and glass mosaics will offer alternatives to the usual and expected mosaic designs. 2. Grey will continue to be in demand this year along with taupe and beige. ➢ There are beautiful grey soapstone countertop varieties that when left un-oiled or waxed stay light like the one pictured here in Houzz.The grey soapstone countertops paired with beige cabinets and walls is stunning, don’t you think? 3. There is an increased demand for more textured and tactile materials. ➢ The article mentions honed granite and natural marble, but soapstone countertops lead the pack in tactile appeal! The main mineral components in soapstone include talc, chlorite, dolomite, and magnesite, giving an incredibly soft feeling to the touch. The mineral magnesite is said to bring deep peace and emotional balance to people. Who doesn’t want that along with the soft touch of talc on your countertop? 4. Elegant black will be one of this year’s go-to colors for kitchens. 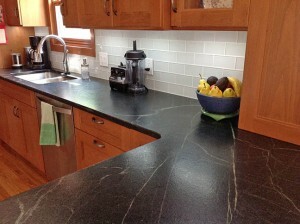 ➢ The reigning queen of beautiful black countertops, soapstone brings all sorts of options to your basic black look. Take a look at some of the design trends for 2015 that are identified by designers to continue strongly through 2016 and beyond. A Soapstone countertop is perfect for all of them!